Now they might find the answer tucked away on a raw hill close to the M4 in South Wales. It’s an array of storage batteries from Tesla, the company of prolific US entrepreneur Elon Musk, who is much better known for his electric cars and his interplanetary travel ambitions. The batteries were installed on the site at Parc Stormy in early 2018. Initially low-carbon cement company Cenin will use them to provide “balancing services” to the National Grid under the “Firm Frequency Response (FFR ) regime”. That means automatically taking power from the grid when there is overcapacity, and quickly sending power back when it’s urgently needed, in response to electricity supply and demand across the UK. But the intention is that Cenin will also be able to use the Tesla Powerpack lithium-ion batteries, the size of three shipping containers, with the storage capacity to power the equivalent of 4000 homes, to store the surplus renewable energy it produce on site for later use. Cenin catches plenty of wind at the 20-acre industrial park on Stormy Down, near Pyle in S Wales. (Although the name seems meteorologically appropriate, it actually derives from a Norman–French landowner who established a farm up there.) And sun too, when it is shining. Add in the company’s anaerobic digester, and there is enough renewable energy to provide much of the power the small enterprise needs. The batteries were installed at the site in February (2018) by KiWi Power. It is one of the largest such power storage installations in the UK. Parc Stormy chips away at the argument that we will always need large-scale “baseload” electricity generation. Traditionally this has been coal power, scheduled to be phased-out in the UK in the 2020s; and nuclear power stations, which are hugely expensive, slow to build, and an awkward legacy for future generations. The biggest installation of Tesla storage batteries to date is in Australia, in an area notorious for grid power outages. Solar arrays combined with Tesla’s residential battery system, the Powerwall, on and in 50,000 homes will create the biggest “virtual” power plant in the world. Tesla’s larger Powerpack batteries have also been deployed in Newfoundland, and, on a smaller scale, in other parts of the UK. Before the availability of batteries such as the Powerpacks, renewable energy producers had no effective way to harness the energy they generated for later use. Now energy can be stored and distributed even when no renewable energy is being generated. Under the FFR scheme which Cenin are signed up to, landowners and businesses are paid to host a battery energy storage system on their land, which lets them avoid peak time electricity charges. In the case of Parc Stormy, the project is backed by “an unnamed investor”, who will take a proportion of the FFR revenue. Kiwi takes a fee for managing the batteries, while Cenin gets a share of the project’s revenue. After 2020 the company may be able to use the batteries to store the excess renewable power it generates. Stormy Down is not such an unlikely place for the next big thing in the renewables story. From up here you can see Swansea Bay, where the government is still pondering whether or not to authorise the Swansea Lagoon. This revolutionary project would power the equivalent a city of 180,000 people by harnessing the energy of the tide. And just down the M4, the oxygen plants at Port Talbot have been identified as a possible centre for producing hydrogen to power cars and trains. In March 2010 the then Labour government designated South Wales as the country’s pioneering Low Carbon Economic Area (LCEA) for hydrogen energy generation, although little has been heard of the initiative since. Cenin Renewables moved onto Parc Stormy, which had been a wartime, then peacetime, training base for the RAF, an early warning radar station, and the site for Sunday markets and car boot sales. It had identified the land as a place to make a business from a low-carbon technology invented by Cardiff University. In essence it is a process which converts mineral wastes from the power and steel industries into a type of cement with a very low, or, in some products, zero carbon footprint. The plan was to create an economy using natural resources and waste products procured locally. Cenin installed its first solar array in 2011. It was the largest in Wales at the time, with a generating capacity of 735kW. 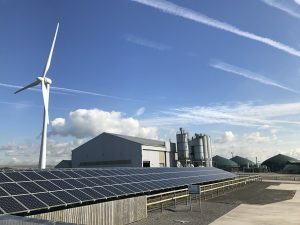 In 2017 it completed a 3MW solar array about 20 miles away near Cardiff. In 2015 Cenin erected its first wind turbine, producing 1.5MW of electricity, enough to supply the total energy needs of 1500 houses. It has permission for a second turbine, with an output of 2.5MW. Another source of renewable power at Parc Stormy is an anaerobic digester, which takes food from schools and local catering outlets and surplus crops from local communities and farms. Food waste breaks down to produce biogas, which is converted into energy; excess heat is used in the cement manufacturing process. The unit produces a constant 3.2MW of electricity, 24-hours day, year round, enough to power 5900 homes. These sources should enable the cement factory to be self sufficient in energy. Another conspicuous feature on the site is the Solcer House, a zero-energy dwelling which generates more power than it uses – exporting the surplus to the National Grid. Designed by the Welsh School of Architecture at Cardiff University, it uses mainly established technology, such as solar panels and LED lights, and an innovative energy-efficient design. Features include draught-proof doors and windows, high levels of thermal insulation and reduced air leakage. Local schoolchildren, on a visit this year (2018), were so impressed they resolved to write to their MPs and the BBC’s Newsround programme asking why all new houses are not built to this specification. The big arguments in favour of renewable energy generation, combined with storage, is that it can be set up in a matter of months. The main challenges, as renewables expand, is most likely to centre around the supply of the raw materials needed in batteries. But there are promising developments in battery manufacture, which could make them cheaper to produce, using abundant raw materials. Researchers at RMIT University in Australia have demonstrated a prototype rechargeable proton battery which uses a carbon electrode to store hydrogen, and a fuel cell to generate electricity. The developers speculate that it could be used to power devices, vehicles, and homes in the future. Using only water and freely-available carbon, the battery would be sustainable and cheap.